We started Wealthfront because we believed technology could have a powerful impact on people’s financial lives. And the more experience we gain with clients, the clearer it becomes that automating financial advice will lead to better outcomes. To back this assertion we have been collecting savings data since we launched our financial advice engine, Path, in February 2017. Today we are thrilled to share the results for the first time. 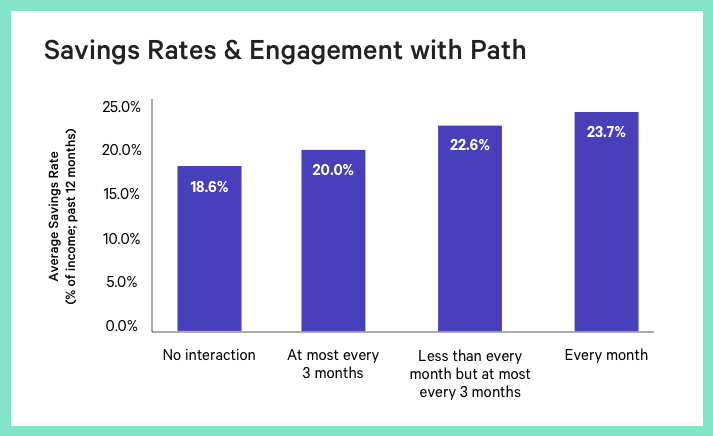 We found that regular engagement with Path correlates to an increase in a client’s savings rate from 18.6% to 23.7%. That is nearly a 28% increase in savings and for a 32 year old client with a $130,000 income and $100,000 in savings that could mean an additional $1.25 million at retirement. It’s incredibly rewarding to see people voluntarily saving over three and a half times the national savings rate* when they are provided a convenient and delightful software-based solution. These results motivate us to empower many more people with automated advice to increase their savings. Only through automation can we make a major dent in the savings gap that threatens a huge portion of the American population from retiring comfortably. *According to June 2018 data from the U.S. Bureau of Economic Analysis, individuals were saving as little as 6.8% of their income. The 2018 Wealthfront Savings Report has been prepared solely for informational purposes only. Nothing in this material should be construed as tax advice, a solicitation or offer, or recommendation, to buy or sell any financial product. Wealthfront Software LLC (“Wealthfront”) offers the software-based financial advice engine, Path, which delivers automated financial planning tools to help users achieve better outcomes. The information set forth herein has been obtained or derived from sources believed by Wealthfront to be reliable but it is not necessarily all-inclusive and is not guaranteed as to its accuracy and is not to be regarded as a representation or warranty, express or implied, as to the information’s accuracy or completeness. Wealthfront is a wholly owned subsidiary of Wealthfront Corporation, and an affiliate of Wealthfront Advisers LLC.